Are you up for exhilarating outdoor adventures? Have a pal or partner hounding you to hit the hills? Simply want to get fit while enjoying awesome surroundings? If you're wondering how to get into mountain biking, this guide is for you. Whatever your past MTB experience, we want you to be ready to tackle the trails. Read on for fundamental skills, top bike selection tips and accessible locations to tune-up your technique. As well as that we've got some fantastic features to make sure you're equipped for day-to-day mountain bike life. It's simple - just sit on a bike! The most important thing is reach, because while you can adjust the seat height, you can't alter the length of the frame. Prioritise control and be sure you can comfortably shift your weight behind the saddle while on the ride. Check out our guide for how to find the right size mountain bike for more details. …is personal preference! 27.5" wheels are agile and light, while 29" wheels are perfect for straight lines (but less ideal for winding trails). Rider height is also important; for instance, a smaller rider may find 27.5" wheels more manageable. This varies with the trail. Thin, shallow treads suit rides on dry ground, whilst wider, deeper tyres are perfect for muddy meanders. Try to get a balance between what suits you and where you will be riding. Front suspension allows you to conquer almost every obstacle a beginner may face. Also known as Hard-Tail bikes, their fixed rear wheel ensures you learn to pick the best lines on the trail and adjust your body position to suit. The Voodoo Bizango is a technically impressive, multi award-winning choice. At an affordable price, Hard Tails are a perfect fit for beginner trails across the UK. Featuring motors in the wheel hubs or frames, Electric Bikes can help riders go faster for longer and take on tougher tracks with support. If you're looking to take uphill battles head-on, or are coming back to cycling after a while away from the saddle, they're the perfect fit for you. 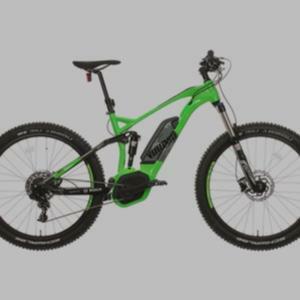 Check out the Voodoo Zobop-E.
Also known as Dual Suspension, these bikes are superb at handling tough or tricky terrain. Having both front and back suspension lets both wheels move more freely. 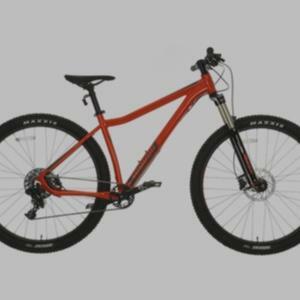 As you gain more confidence, full suspension mountain bikes will be a great choice. For a brilliant example, why not take a look at the Boardman MTR8.8? Before hitting the trails, it's time to sharpen your skills. Using the correct technique will make life much easier whether tackling steep downhill descents or overcoming obstacles. Check out this short video from MTB Coach Sam Fowler as he explains how to improve your Mountain Biking. At trail centres, you'll find an array of coloured arrows indicating different potential routes. For a beginner, this could prove to be a bit of a puzzle. What do the arrows mean? What trails should you take? These are the easiest, with smooth, wide tracks and shallow climbs. A perfect fit for beginner mountain bikers and families. Blue is the next step up, requiring reasonable fitness and some biking experience. You'll meet short steep climbs, loose surfaces and tree roots. They're a great way of building up your MTB confidence. Red demands experience and technical skill. The trail width often decreases to singletrack, demanding riders to pass in single file. Expect berms, stones and steps, and be sure you're ready to master these obstacles before attempting. The trickiest trails solely for experts, featuring unforgiving gradients and obstinate obstacles. Ones for the future. Trail gradings can vary from centre to centre, so we'd recommend research in advance. Our advice is to stick to greens and blues. However each of the centres featured have reds and blacks as well, so you'll be able to progress once you're ready! We've rounded up some great trail centres for beginners in the UK's favourite MTB locations. Read on to find out about Mountain Biking near big cities and trails in Wales, Scotland, the Peaks and the Lakes! The UK has plenty of great locations for escaping the 9 - 5 and getting back in touch with nature. 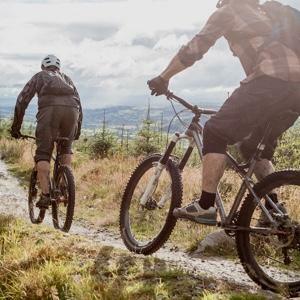 We've compiled four of the best MTB trail centres for beginners, just an hour's drive from some of the UK's biggest cities. Should the Royal Family hit the trails, we have a hunch they'd head for Swinley. 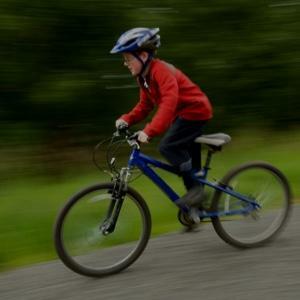 Located on the Crown Estate just an hour from Buckingham Palace, Swinley Bike Hub provides 24 km of purpose-built riding. Its green trail is perfect for entry level riders, whilst blue and red routes offer scope to step up the challenge. 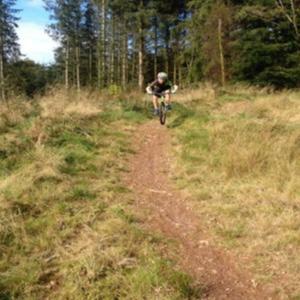 Cannock Chase's green and blue graded Fairoak and Sherbrook trails provide perfect options for those beginning to bike. Master these and you'll be tackling its famous Follow the Dog and Monkey trails in no time. As an area of natural beauty the Chase is a perfect place to escape in the heart of the country. Ancient woodlands, wild boar and rich history add to the charm of the Forest of Dean. Located within easy reach of Bristol, Gloucester and Cheltenham, there are routes available for riders of all levels. 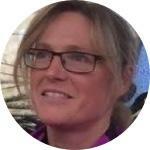 Beginners should start on the blue grade Verderers? trail before stepping up to the red grade Freeminer trail. We're stretching the hour's drive slightly, but for those in the North East, Kielder Forest is a go-to for all levels of MTB. With over 100km of riding available, there's scope for all abilities. 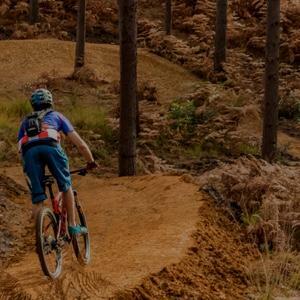 Families will enjoy the green graded Borderline trail whilst those looking to step up their skills should try out the breath-taking Osprey MTB trail. Wales is well loved as the heartland of British MTB. From Snowdonian adventures to rugged routes within reach of big cities, Wales has something for everyone. There's a huge variety of trail centres and routes to pick from, but we've selected four of our faves. Within an hour of both Cardiff and Swansea lies Afan Forest Park. From its visitor centre you can embark on a great range of trails for riders of all levels. Head along the Afan Valley for a green graded rookie route with an optional blue grade trail to finish for those who want to progress further. Over the last ten years, the folk at Oneplanet Adventure have been cultivating an excellent location for Mountain Biking in North Wales. 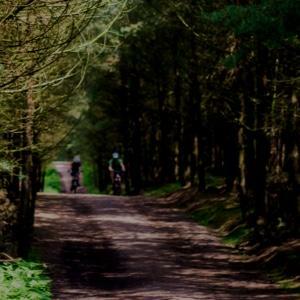 Easily accessible from Liverpool and Manchester, Llandegla has something for everyone. A 5km green route and 12km blue route help beginners ease in and develop the skills needed for their red route. Coed y Brenin was the UK's first dedicated Mountain Bike Trail centre, and continues to provide thrilling routes for all abilities. It's a true hotspot for Mountain Biking in Snowdonia. Practise in the dedicated Foundry skills area, before tackling the green Yr Afon or blue Minor Taur trails. 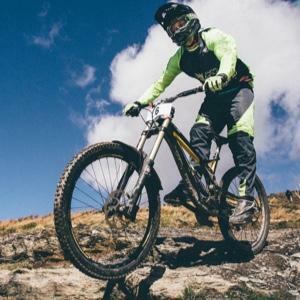 Staying in Snowdonia, Antur Stiniog hasn?t always been considered an ideal location for MTB beginners. Indeed the majority of its routes shouldn't be attempted by novice riders. However their recently developed blue grade routes and uplift services provide an entry point to the exhilarating world of Downhill MTB. 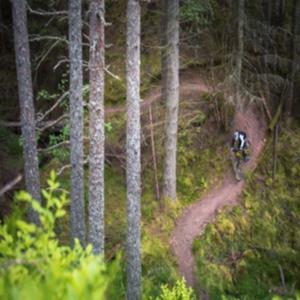 Rugged woodland rides define mountain bike trails in Scotland. 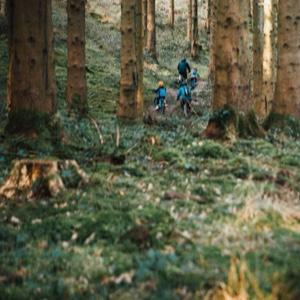 In recent times the Forestry Commission has invested heavily into the 7stanes: seven trail centres every Mountain Biker should try out. Routes are well maintained and great fun for beginners and experts alike! If you're ready to make the trek to the Scottish Highlands, Moray Monster Trails has a bunch of blue graded routes for early riders. The Haggis, Soup Dragon and Gordzilla can be enjoyed by beginners getting to grips with the Mountain Biking scene. Drumlanrig is a great location for novice MTB-ers to work their way up through the castle woodlands. Its four green grade routes are great fun for families, but the key is in its scope for progression. Copy Cat, a blue graded trail, shadows the Old School red route. This allows riders to mix and match whilst working towards riding on tougher trails. 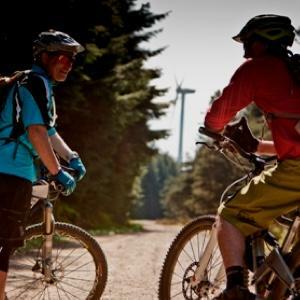 Glentress is renowned honey pot for Mountain Bikers in the heart of the Tweed Valley. Its green and blue graded trails are specifically designed with novices in mind and provide some great riding. Once you've built up your skills you?ll be ready for the legendary Innerleithen trails nearby. Don't jump in too soon though! These routes are for experienced riders only. In the shadow of Ben Nevis lie the famous Witch?s Trails of Fort William. Whilst you might be heading here for the Mountain Bike World Cup in June 2018, the centre also has some good options for beginners. 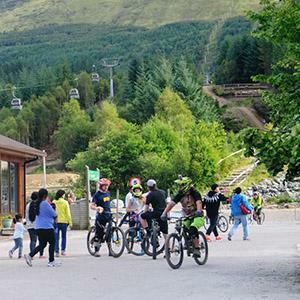 New trails Voodoo and the Blue Adder are proving a hit, whilst gentler rides can be had in the nearby Leanachan forest. The Lake District is a scenic location for mountain bike holidays. There's plenty of beginner riding to be had in the foothills of England's highest peaks. Try out its two dedicated trail centres or wind your way around the waters. 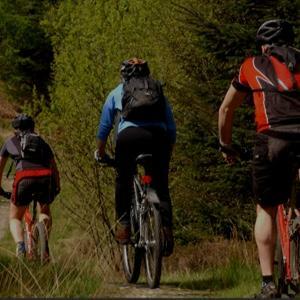 Whinlatter provides the longest dedicated Mountain Bike trails in the Lake District. 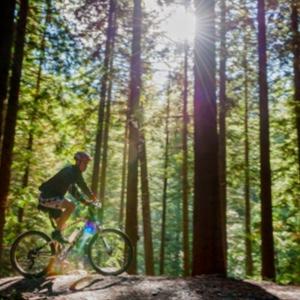 The Quercus trail offers an excellent option for those with basic off-road skills, whilst you can also engage in a spot of Mountain Bike orienteering to navigate your way through the forest. Routes beginning at Grizedale Visitor Centre cater for a range of tastes in the woods alongside Coniston Water. The Moor Top trail is great for those bringing along kids and awesome views await on the achievable Hawkshead Moor trail. If you draw lines between Leeds, Manchester, Sheffield and Derby, they converge right in the heart of the Peak District. The Dark Peak to be exact, near Hathersage and Edale. Not surprising, as this was the first and still is our favourite National Park. It's a haven for sports like mountain biking - if you know where to ride. Ladybower Reservoir quenches the thirst of these cities with easy and well marked out trails to suit all levels of rider. For the adventurous beginner willing to ride uphill superb views await you, with swooping descents adding smiles to the miles, before you return to the visitor centre for refreshments. Many of the nearby gritstone edges also have bridleways to test your new found skills on too. Further south at Ashbourne, the High Peak and Tissington Trails converge. Nearby bridleways weave through the picturesque valleys around Hartington. These provide easy trails for beginners as well as the more advanced rider. All you need is a sense of adventure. The National Park visitor centres provide excellent riding information, including routes, to make this area a bikecation sensation. A pair of gloves will keep your fingers warm and give additional grip. They'll also add protection from any falls! Although getting mucky is part of the thrill, mudguards keep off the worst dirt and prevent you from getting soaked through. Lights are essential for low-lit or night time rides! Shorts or trousers? 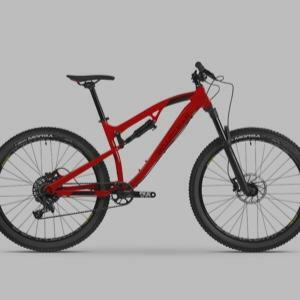 It's a great Mountain Bike debate, which ultimately comes down to personal preference. See what suits you! Helmets are a universally accepted part of MTB kit. You'll thank us if you take a fall. Grab a few jerseys and you can be set for any season. Whether you're after breathability on summer rides or winter warmth, unrestricted movement is key! Going out on a big adventure? A hydration pack or water bottle is a must. Packing a spare inner tube and bike pump will prevent a flat from ending your day. Glare-free glasses save you squinting on sunny mornings. Finally, grab an action camera to record your best moments on the trail! Make yourself known: When approaching walkers or horses out and about, be sure to let them know without startling them. Slow down and ping your bell. On the trail, a cheery "Coming up behind you!" or "Rider on your left/right!" will do! Left is right: Just like driving, ride on your left. This lets riders going in opposite directions pass one another with ease. This is essential on narrow or tricky terrain. Patience is a virtue: If you find yourself closely following another rider, either on a long trail or any stretch of single-track, stop and give them space. That way, you can ride after them as fast as you like! Perfect partners: Cycling while chatting with a friend is a great way to ride. However, be courteous. Ensure you're always giving other riders enough room and not bumping handlebars. The Good Samaritan: The best mountain bikers always stop to help a rider in distress. Even if it turns out that they didn't need a hand after all, it's always favourable to ask! where you ride your mountain bike! Trails may be natural or man-made, and the latter may be graded for difficulty, similar to ski runs. a narrow mountain bike trail that is only wide enough to ride in single file. a banked corner on a singletrack trail that allows you to carry more speed through that section. a short, steep drop over rocks, roots or a natural step. the uphill version of a drop-off! a section of trail that is particularly rooty or rocky. describes technically demanding terrain such as roots and rocks that test your riding skills. a purpose-built mound of earth with a wide, flat top that can be jumped or rolled. a jump with a space in the middle that needs to be cleared. what you get in the split second when both wheels are off the ground over a jump or drop. falling off face-first when you hit an obstacle or land a jump incorrectly. Best to be avoided. riding with a high degree of skill, at speed. a fast, exhilarating trail, and also the term for that euphoric moment when you are riding that trail at your best and loving it. In other words, the reason we ride. We've made a start, but it's time for you to overtake us! We hope you're ready to get out and about and see some trail action. There's huge scope for progression in the mountain bike world; we're sure you'll soon be pedalling on to greater things!